Odds are, you don't know about the Israeli Defense Forces covertly airlifting 8,000 Ethiopian Jews from Sudan to Israel in 1984-85 in what was called Operation Moses. Operation Joshua brought 500 more later that year, and Operation Solomon airlifted nearly 15,000 more people out during a 34-hour period in 1991. Ross Weissman '08 can tell you all about it, though. 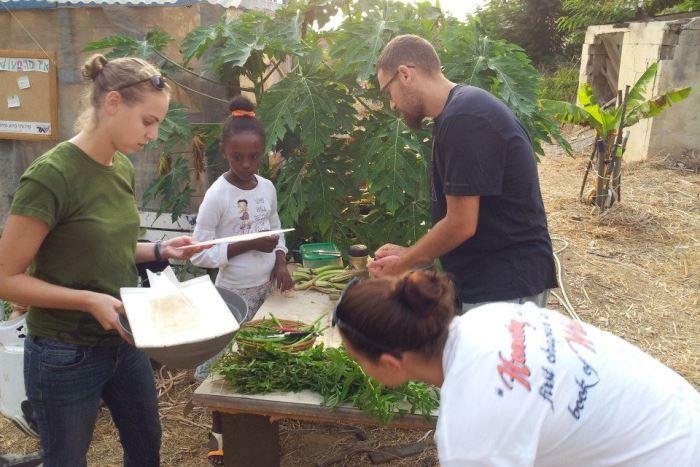 A religion major while at Dickinson, Weissman now lives in Gedera, Israel, and works with the Yahel Social Change Program, dedicated to improving the lives of the city's Ethiopian Jewish population, which totals 120,000 nationwide. "Our program generally touches on things that are related to Jewish identity abroad or in Israel," Weissman begins, explaining that Yahel runs a long-term program in Gedera and short-term programs across the country. Working on the recruitment side, Weissman focuses on how Yahel can get people from abroad, North America and beyond, to engage in this work in Israel. He is also reaching back to Dickinson, and two alumni—Jessica Baverman '09 and Benson Ansell '10—are already on board with the Yahel team. With a master's in social work and nonprofit management, Baverman, a dual history and women's & gender studies major at Dickinson, says she "wanted to do a program abroad that combined my passions for migration and social justice. Yahel had both of those, and I think my work here is definitely making a difference." "We work a lot with youth, a lot with the next generation," says Weissman. Alongside Friends by Nature, an Israeli nonprofit focused on community empowerment and education in Israel's Ethiopian communities, Yahel partners with a local youth center, creating a safe and structured space for young people to engage socially. "We base a lot of our work on identified community need and try to structure different programs based on what is identified." For instance, the Garlic Project. "Most of the Ethiopian men who come to Israel were agriculturalists, and when they arrived there was often a huge cultural clash," Weissman explains. "So we engage at-risk older men in the community to provide them an opportunity to work the land, grow garlic together, do something that they're good at." Another prong of Yahel's work involves garinim ("kernels" or "nuclei")—people who live and work inside struggling Ethiopian neighborhoods, influencing them from the inside. "We have a cohort of eight people living in Gedera, in the Shapira neighborhood: community gardens, youth centers, schools, tutoring—it's all focused on that one neighborhood," Weissman says, noting that Baverman is one of the eight. "It's about building from the ground up." In the Shapira neighborhood, Baverman focuses on tutoring Ethiopian students in English, which she does both in their homes and in an elementary school. She also recently has undertaken the task of teaching English to adults, something she both finds rewarding in terms of making connections and considers a significant step for her pupils. "English is really important in Israel, as it opens up a number of professional opportunities," she says. "It has taken a few months for me to feel less awkward and be more 'Israeli,' but I feel that I have begun to make strong relationships." Ansell, an environmental-studies major at Dickinson, also cites tutoring as one of the more impactful aspects of his time spent in Shapira, especially in terms of his relationship with Daniel, a 14-year-old Ethiopian boy. "This is a very special and meaningful placement for me," he begins. "When we first started meeting, Daniel's English knowledge was very minimal, and my Hebrew was almost nonexistent, so many people wondered how our relationship was going to work." What he found instead of difficulty was a "perfect situation," one in which they began their relationship on equal ground. "I find this perfect because we are both simultaneously the teachers and the students; we are both empowering ourselves by both learning and sharing knowledge." Weissman studied at the Conservative Yeshiva in Jerusalem, in an immersive Judaic-studies program, from January to July 2010, but notes that the path to Gedera began to materialize even earlier, while at Dickinson: He worked with Hillel, EarthNow and Umoja, an education-centered youth-development group, which, he says, "was very much about unity and celebrating campus diversity." He was also involved with Spectrum for a semester. "People often ask, 'What do you do with a religion major?' " he continues. "And I say, 'I studied religions, but I also was a liberal-arts student. I engaged in many big questions, in many different forms, whether it be through writing, in research or in critical and engaging discourse.' My job would be a tough one to have if I had a narrow focus coming into it."